Today, I bring you a food that is flexible, freezable and easy to carry with you, and makes for a simple and inexpensive lunch. Today's burritos are the perfect commuter food: you can make these guys in volume over the weekend and eat them at work during the week. You can take them with you in the car, train or bus without them getting smushed or manhandled. And they are easy and convenient to eat during your workday--heck, you don't even need a utensil to eat them. Every couple of months we'll whip up a huge batch of 30 of these guys, freeze them up en masse, and then we've got lunches (or even an emergency dinner if necessary) for weeks, just waiting for us in our fridge. 1) Brown ground beef in a skillet, drain off fat. 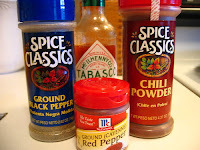 Then season the ground beef very generously with a couple of heaping tablespoons of mild chili powder, and depending on how much "heat" you'd like in your burritos, add cayenne pepper, Tabasco and/or black pepper. 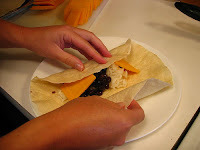 2) Set up the black beans, rice, beef, cheese and any other ingredients you are including in your burritos into an assembly line, such that it is easy to spoon each ingredient onto the tortillas. 3) Heat each tortilla for 10-15 seconds on each side in a non-stick skillet set on medium high heat. This will make the tortilla pliable (you should only brown it very slightly if at all). 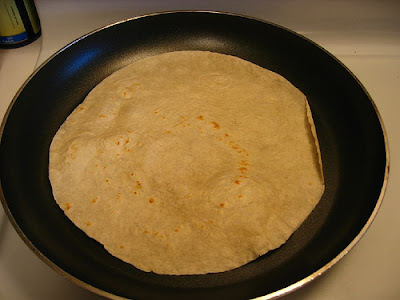 Place the heated tortilla on a plate, and spoon each of the ingredients from your "assembly line" onto the tortilla, being careful not to overfill it. 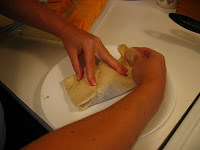 4) Fold the tortilla over lengthwise and crosswise as shown in the pictures to the right. 5) Place in a 9x13 pan or a large cookie sheet and bake for 20 minutes at 275F. These burritos freeze very well, and can be microwaved (2 minutes on high) for a quick, healthy and balanced meal. Also, be sure to consider any recipe modifications that might strike your fancy with this dish. You can certainly add in sauteed vegetables like onions or peppers. Also you can consider other meats like chicken or chorizo. Vegetarian or even vegan burritos would also be a snap--just include more veggies and legumes and of course leave out the meat and/or cheese (note you'll also have to make sure your tortillas aren't made with lard--fortunately most store-bought tortilla brands like Tyson are made with vegetable shortening). Burritos are a flexible dish and they allow for all sorts of substitutions and improvisations. Also, calling all serious purists out there! If you're interested in a great blog post on how to make homemade flour tortillas, then run--don't walk--to Homesick Texan for a clinic on the subject. Her work looks absolutely amazing. What a fabulous idea, and you make it look simple. Thanks! You are welcome! Thanks for the positive vibes. So. 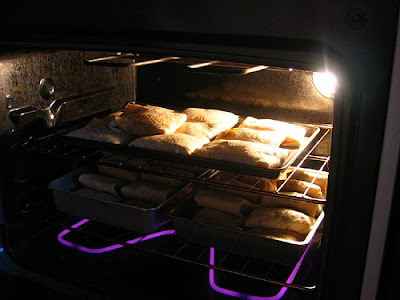 . . are you baking then freezing? Or do you wrap and freeze and mike them when you're on the run? Yes, bake them then freeze them. Then they are easy to handle when you take them to the office and you can nuke them for a quick lunch! Mmm...burritos... Reminds me of the episode of The Osbournes when Ozzy discovered Chipotle for the first time. He filled his refrigerator with burritos and offered them to any and all. "W-w-w-w-wou-w-would anybody like a b-b-boo-ree-toe?" But on a more serious note, being the Jose that I am I'll offer a couple tweaks to make these burritos really pop! When browning the beef, add cumin, oregano, and paprika in the proportion of 1 tsp of each per pound of meat in your recipe. It'll give the beef a heartier flavor that chili powder alone can't touch. When filling the burritos I'd make two tweaks. First, grate the cheese. I know it's time consuming, but think of the cheese as a seasoning that you want to blend throughout the burrito. It also makes this part easier... Before filling the burritos, mix all the ingredients together in a large bowl, and spoon the mixture into the tortillas. 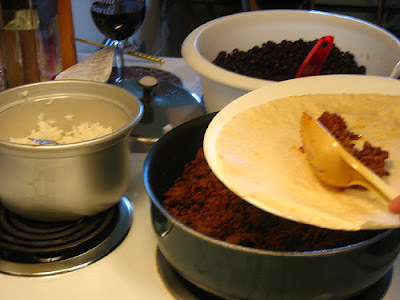 This mixing accomplishes 3 things: it gives you 1 dirty bowl to clean rather than 4, it prevents the oil from the cheese from pooling and dripping out of the burrito, and it makes sure that you eat a holistic burrito rather than an empirical one (ie: there will still be beef left when you get to the second half of the burrito). 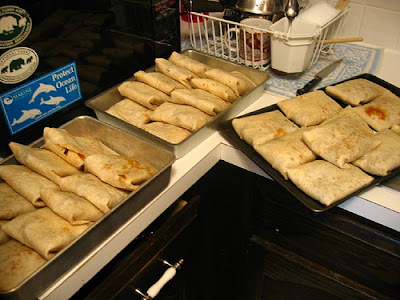 I once cooked burritos for a family reunion (27 people), and of course I had various random ingredients left over when I got down to the last several tortillas that needed to be filled. Well, I just filled 'em up with whatever was left. When dinnertime rolled around I put the burritos into three platters. I labeled one "spicy" and another one "mild." I labeled the last platter "laggards and misfits." After dinner was over (to rousingly positive reviews I might add--it was a big success), my cousin came up to me and said: "I just had one of your laggards and misfits. Allllllll cheeeeeessse." So that's been my lunch for this week. I dispensed with the baking part and just relied on the microwave at work to cook 'em enough, although I did add the beans to the meat while cooking the meat. Oh, and I used ground turkey and ground chicken, because Mrs. Wirehead is Hindu and we don't have beef in the house. I wanted something like a good Mission Burrito, so I added salsa. Sadly there's pretty much no good way to do guacamole and sour cream in a commuter-friendly way. I also used some of the Tortillas to make breakfast burritos. Yes, thank you for the input, Wirehead. I should have spent a paragraph warning people of the dangers of trying to include guac or sour cream in a burrito destined either for the freezer or for commuter food. Not a good idea. Delicious! I made these tonight using onion, green pepper, a can of diced tomatoes w/green chili peppers (drained really, really well), pinto beans, ground turkey, jack cheese and spices. It was so easy. I never thought of making a bunch ahead, so I'm really excited to not have to take ANOTHER salad to work. 2 lbs. of meat and all the veggies and stuff made 16! Next time I'll add rice (made the night before when I cook Japanese food) and try going for the gold-30 burritos! I'm so happy you had so much success with this post! That is why I write Casual Kitchen. This is a great idea! I only used 2lbs of meat and I used brown rice but we just ate 4 burritos for lunch and I now have 10 for the freezer! Thanks so much for posting this! Any time Mandy! Thanks for the feedback, and I'm so glad you found value from this post. Just found your blog and am excited to try some recipes. I especially like the looks of these burritos. Nothing like a good do-ahead lunch/dinner. I roasted some of my homegrown tomatoes this summer and then froze them for later use. I think they would make a fabulous addition to this recipe! Thanks! Loving this and will make it tonight! My boyfriend is an accountant and doesn't have a lot of time for making meals. I'm going to make them to keep in his freezer. But I'm curious, what's your recommended means of wrapping them up and freezing them? We will freeze them in groups of two or three in large ziplock bags, or if we are running low on those, we'll double-wrap them in simple grocery store bags. They hold up quite well in the freezer. my tweak was this... we get seasoning cubes called MAGGI from afro carribean grocery stores, crushing about three into your ground beef (or whatever choice meat) as you're cooking it just makes it taste amazing! also i added salt, and used hot chilli flakes as opposed to mild chilli powder. oh and i also used extra large garlic tortillas... freaking awesome. 450g of beef got me 7 burritos. Epicurean, thanks for the great tweak and the great feedback. Fantastic post & can't wait to make them this week with roast veggies! just curious- is Monterrey jack the ideal cheese for this or will a cheddar be just as nice?I've never tried jack cheese so not sure how it tastes! also how much rice would you recommend for each burrito? Anonymous, either cheese will work. Choose whichever cheese you prefer. 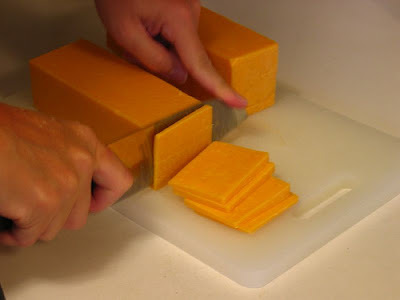 We typically use cheddar. And regarding rice, a spoonful or two should be enough per burrito. Thanks for your questions and good luck! Any time, Anonymous. Thanks for the feedback and positive vibes. Thanks for the advice im looking at starting up a store however have no idea what equipment is needed, ive read something about a steam table for the burritos but im unable to find them anywhere in the UK, can you please advise? Can I omit the cheese and chili powder to make it taste better? Anon, of course! You can put (or not put) anything you want into these. That's the beauty of this recipe.